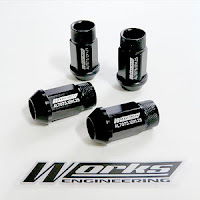 The Works Engineering Racing Wheel Nuts are made of Aluminium 7075-T6. These lug nuts are extremely strong and light. A set comes with four nuts M12 x P.15 19HEX black titanium hard anodized finish.